Pelican vs Yeti: Which coolers are better? Both Pelican and Yeti are top-tier brands of premium coolers. They both specialize in making high-end rotomolded coolers with pressure injected insulation that will keep food or drinks cold for hours. For someone looking to purchase a premium cooler, the important question is: Which brand of cooler is better? In our comparison of Pelican and Yeti coolers we compared Pelican's Elite Progear coolers with Yeti's Tundra series. It's important to recognize that the named sizes of these coolers are very different. For instance a Pelican 45QTcooler has an actual internal capacity of 47 quarts while the Yeti Tundra 45 has an actual capacity of about 32 quarts. Also, the Yeti Tundra 65 only has an internal capacity of 52 quarts while the Pelican 65 Qt has a capacity of 69 quarts. This makes it more difficult to compare the prices and sizes of specific coolers. Take a look at our cooler sizes comparison chart to see what the real capacities of Yeti and Pelican coolers actually are. Check out the latest prices for Yeti Coolers and Pelican Coolers. After comparing Yeti and Pelican coolers we found that both had different strengths and weaknesses. The Yeti Tundra series coolers had a better gasket that made a better seal between the lid and cooler body. They also had better designed drain plug, easier access to spare parts and suprisingly a better warranty. While Pelican offers a limited lifetime warranty (versus the 5 year Yeti warranty), this warranty only covers parts of the cooler that are extremely unlikely to break and only covers the more fragile parts for 90 days. Pelican on the other hand offers a significantly less expensive cooler with usually much more capacity. 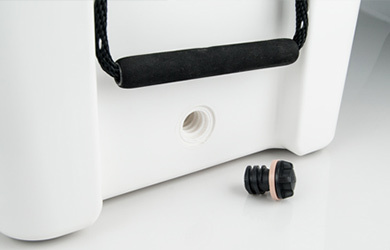 Pelican also offers more robust and easier to use locking latches that are made from tough ABS plastic. Both Yeti and Pelican offer good warranties on their products. Pelican offers a limited lifetime warranty. This is great but unfortunately it does not cover the cooler's seal and gasket, a part of every Pelican cooler that is most likely to break down over extended use. You can read the full warranty here under the Coolers section. The Pelican warranty states: "This lifetime guarantee does not cover the wheels, rubber feet, drain plug/spigot, gasket, cooler accessories or color fading, which Pelican warrants against defects in materials and workmanship for a period of 90 days from the date of purchase." The fact that some of the most important and fragile parts of the cooler (gasket, drain plug, feet, etc) are only covered for a period of 90 days from purchase is unfortunate. On the other hand, Yeti offers a very good 5 year warranty that does indeed cover all pieces and components of the cooler. While it's not as long of a warranty as Pelican, more is covered with Yeti's warranty and customers have reported that Yeti is actualy very generous when it comes to honoring issues with their products. It's great that Pelican's warranty is valid for the lifetime of the cooler, but that really doesn't mean much when the most fragile and important parts of the cooler are only covered for 90 days. Damaging the hinges, rotomolded body or latches on your Pelican is next to impossible. Just like the Yeti, it's a bear proof container and these parts are meant to stand up to serious abuse. But what if, two years after your purchase, your cooler's gasket falls out and it stops being able to make a good seal? With a Yeti, you could send it back for a repair covered under warranty. With a Pelican you cannot. However, with Pelican if you actually damage the rotomolded cooler body itself, you can get it replaced or repaired for the lifetime of the cooler. But when you buy a Yeti cooler you can have the peace of mind to know that a problem with any part of the cooler is covered 5 years down the road. 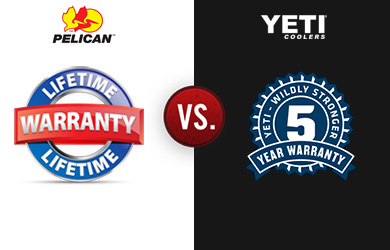 It's hard to say which is a better warranty so in this category Yeti and Pelican are a draw. One of the most important components of any high-end cooler is the gasket. A good freezer-quality gasket will establish a tight seal between the lid and body and minimize any air exchange between the two surfaces. One of the biggest complaints with Pelican coolers is that the gasket does not seal well and over time it can become loose and fall out or get pinched by the lid. The reason for this is two-fold. First, the gasket itself is not made with the highest grade rubber so it can stretch out and not fit well underneath the lid. 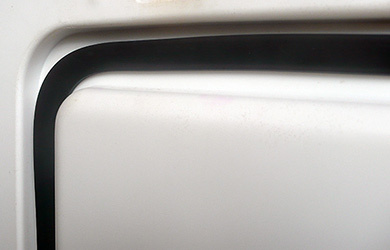 Second, the lid does not have an interlocking groove that holds the gasket in place.This is a huge disadvantage for a "Buy It For Life" cooler, because without a gasket the cooler will let outside air in, minimizing the temperature differential between the inside of the cooler and the surrounding air. This will greatly reduce the cooler's effectiveness. 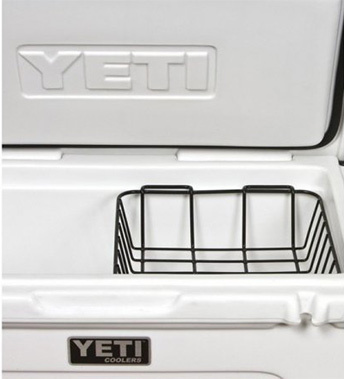 Yeti on the other hand, offers a gasket made from a higher-grade rubber that is comparable to that of a commercial grade freezer door. The gasket is securely mounted inside a groove in the lid of the cooler and unlike the Pelican gasket, it will not fall out and cannot be easily removed. Not only this but the way the cooler lid interlocks with the body creates a tight seal that give you a noticeable sound when closing the lid. You can feel the vacuum seal of the Yeti lid much more strongly that the Pelican. The winner for the best cooler seal is Yeti. The Yeti Tundra and Pelican ProGear Elite lines each offer different styles of closing latches. 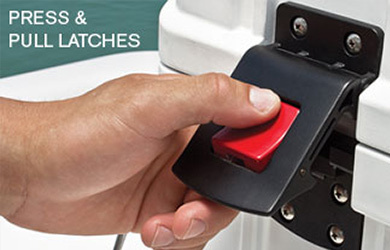 Pelican offers an ABS plastic switch button latch that locks with a simple flip of the switch. This is a nice clean design, that is simple to use and is very sturdy. Yeti offers a T-Grip rubberized latch that stretches down from the lid and locks into place on the body of the cooler. It's also a very solid system and while maybe not as easy to lock and unlock as the Pelican, it still functions well. It still is not as nice as the Pelican latches so the winner for this category is Pelican. 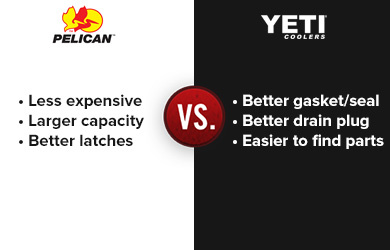 One of the key differences between the Yeti and Pelican coolers is the style of drain system. Pelican offers a simple drain tube with a screw on cap. The cap is held to the cooler with a cheap piece of plastic that can break and fall off easily according to many customer reports. Yeti coolers come with simpler, and more leak proof drain valve plug that can screw entirely out of the cooler. The Yeti drain plug comes with a built in O-ring that seals very nicely and is much more resilient than the Pelican valve. The clear winner in the drain plug category is Yeti. Yeti and Pelican also offer different styles of handles. Pelican offers solid ABS molded handles that swing up from the sides of the cooler. These coolers also come with built in rotomolded handles that are very comfortable. Yeti on the other hand offers nylon handles with rubber grips that also are extremely comfortable. Both styles of handles are good and so its much more a matter of personal preference which style is better. For this category, both Pelican and Yeti are fairly equal. Both coolers come with non-marking feet, strap tiedowns and other little extras. Yeti coolers also come with a dry basket that fits nicely inside the cooler and Pelicans do not. In general, accessories for Yeti coolers are much easier to find. Whether you look online or in physical stores, you can often easily find replacement parts, specialized security cables and other addons for Yeti coolers. Pelican doesn't offer as many accessories as Yeti and getting replacement parts for Pelicans is much more difficult. When it comes to extras, the winner is Yeti. Purely from a build quality and usability standpoint, Yeti coolers are better than Pelican. They offer better gaskets, better seals (and therefore better insulation), a better drainage system, and easier access to spare parts and accessories. It's important to note however that Pelican coolers are regularly priced cheaper than Yetis. Often for $100 less you can buy a similarly size Pelican cooler when compared to a Yeti. However, you run the risk of having issues with the drain plug and/or the gaskets. While you may get lucky and not have any issues with these components, we still think that the Yeti is the better cooler option for most people. Check out the latest prices for Yeti Coolers on Sale! Show Me The Deals! No thanks, please close this.